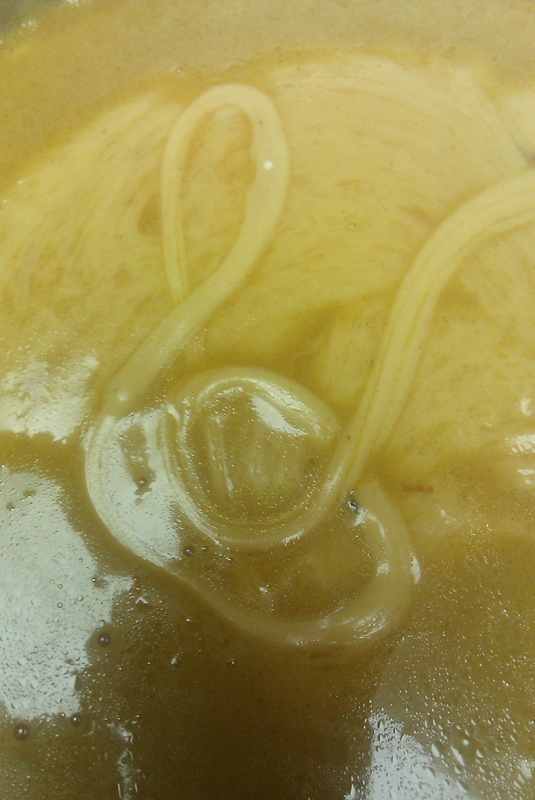 Yes, yes, trust me to find the Wizard of Oz angle in cooking. Because that’s what we are doing today: we are cooking! So, buckle up for the first installment of “Miss Woodhouse’s Culinary Kitchen.” Don’t worry, we won’t be making venison stew. Okay then, we’ll work on your movie quote education later. For now, we cook! First up is Three-Cheese Fondue. – 1 Cup dry white wine. I tapped into my vast wine knowledge *coughGOOGLEcough* and picked out a nice little Pinot Grigio that would compliment but not overpower my cheeses. This was the most time-intensive part of the whole process. I am admittedly unversed in the world of wine, and naively assumed that I could waltz into the wine section with a few names and be fine. Unfortunately, I did not take into account the limited selection of Harris Teeter’s wine list- I scoured the French wines to no avail and there were no Swiss wines. What’s up with that? 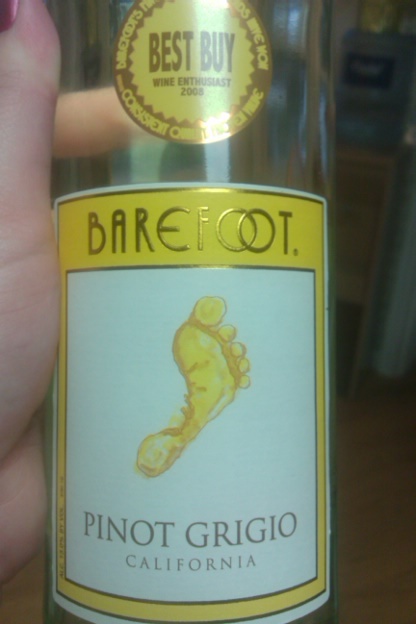 The rest of the white wines were Rieslings, which I was told would be too sweet. So there you go, you know as much about wine as I do. – 7 oz. Emmentaler. 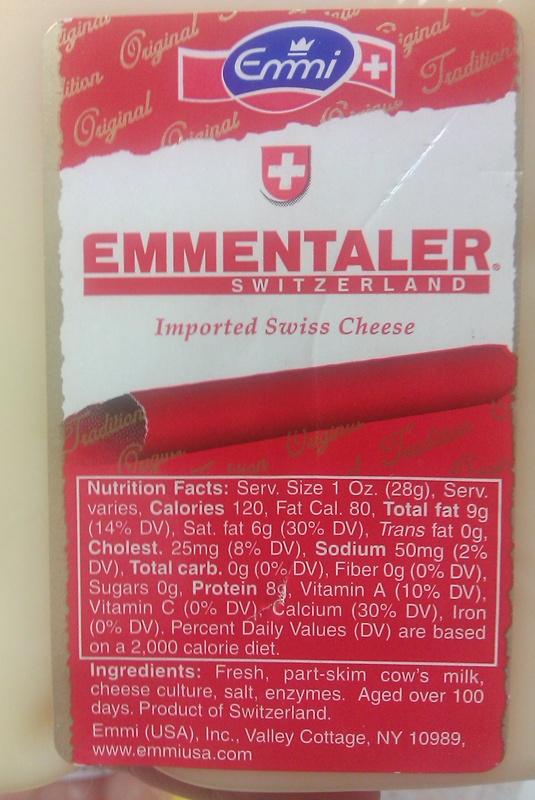 This is the first time that I’ve had Emmentaler on it’s own, and quite frankly I’m in love! <3 It’s not a hard cheese, but it does have a nice, firm texture. Mostly, I was surprised by the flavour. For some reason, I expected it to be a bland, mild, sort of like a BabyBell. I don’t know why I thought this, but there it is. So, I was pleasantly surprised that it is really nice, with a little bite to it. Yay! I think I’ve found another new cheese to add to add to my favourites list. – 7 oz. 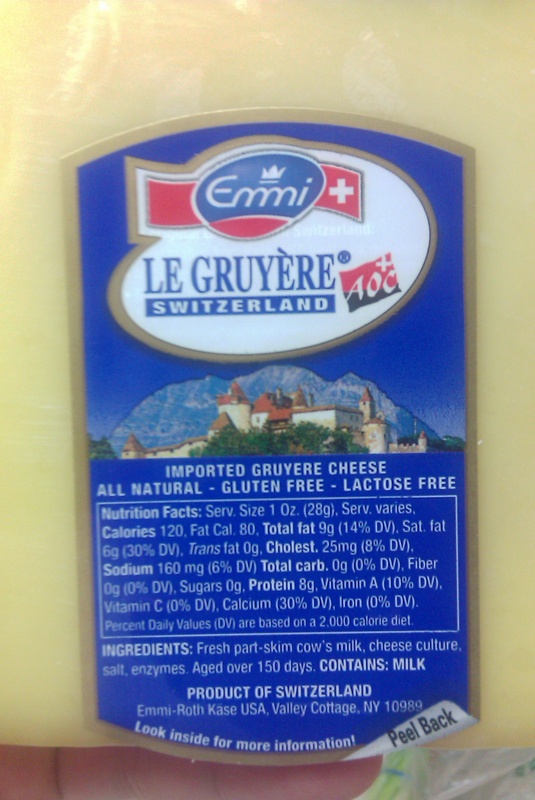 Gruyere. This is the fondue cheese to end all fondue cheeses. Nice and hard, with a smoky finish, it’s long been a favourite cheese of mine. – 7 oz. Sharp Cheddar. This was, by far, the most impressive find today. 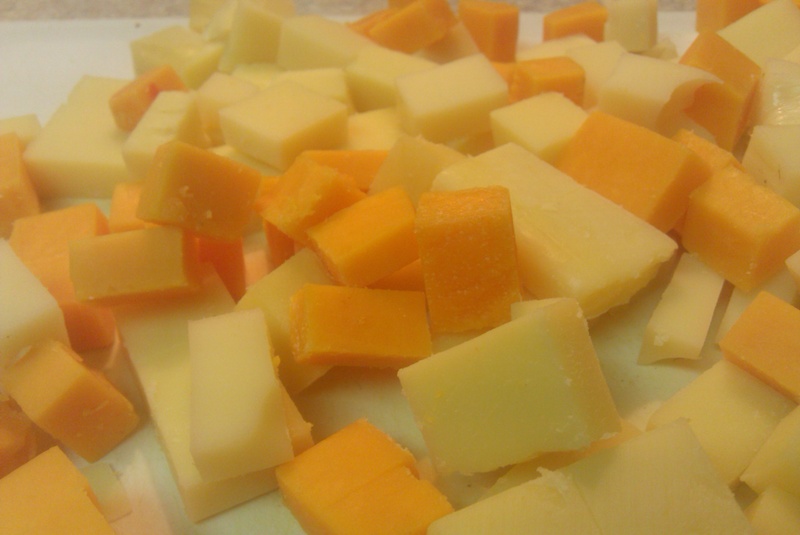 All the recipe called for was a sharp cheddar, and let me tell you, I love a sharp cheddar. My family, well, they tend to not like their cheese so sharp. Case in point, over the holidays I bought an x-sharp cheese, and was disappointed that it was so mild. They found it unbearable. 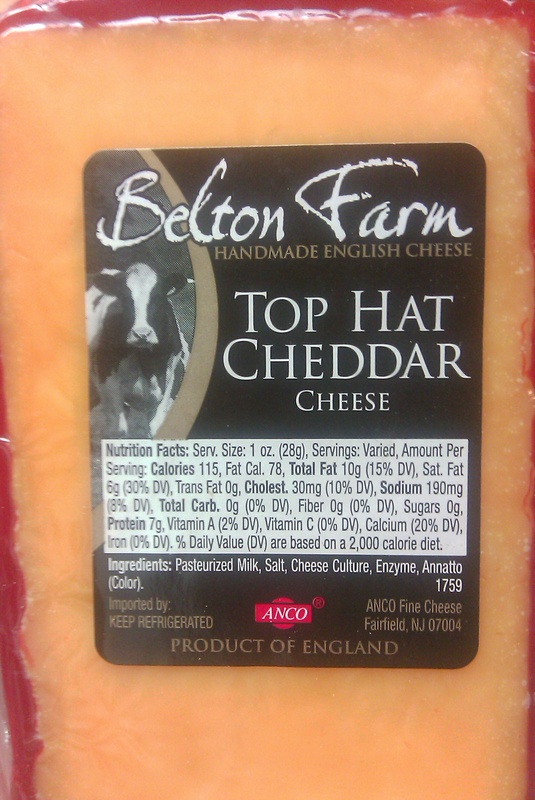 Unfortunately, the only sharp the store had was “X-Rated.” I didn’t want my family to be miserable, so I went with this modest little British made cheddar. Quite frankly, it’s amazing. I can’t wait to buy it again! Okay, so there we are, ingredients at the ready. WAIT A MINUTE!!!! Something’s missing…hmmm, what could it be? Ahh, much better. Now, we can begin. Fondue is super simple. First, you take the butter, pop it in the pan. Then, take the flour and mix it in. 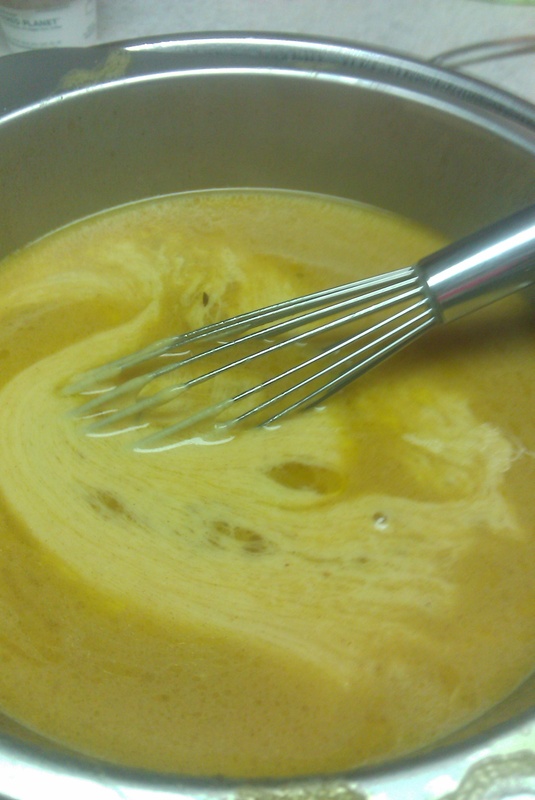 Stir constantly with a whisk for about 5 minutes- you are basically making a roux sauce. 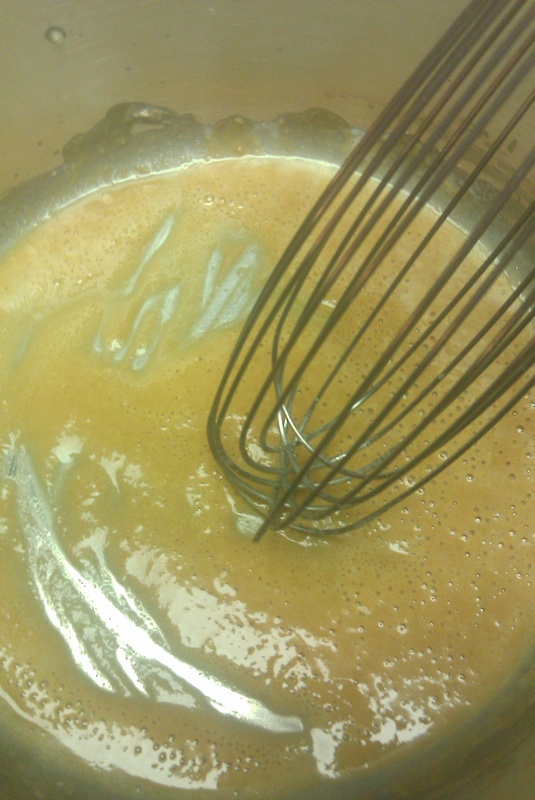 Besides, mixing in the flour now will keep your fondue from being clumpy later on. Or so they say. Okay, so while you are stirring the roux, you should have your white wine bubbling away in another pan to burn off some of the potency. Granted, if you are going for a real buzz, you can just pour it in straight from the bottle. However, I’m cooking for an under-aged kid, and CPS likes it if you don’t give kids alcohol. Fancy that! Add the cheese cubes to your roux and wine and stir. 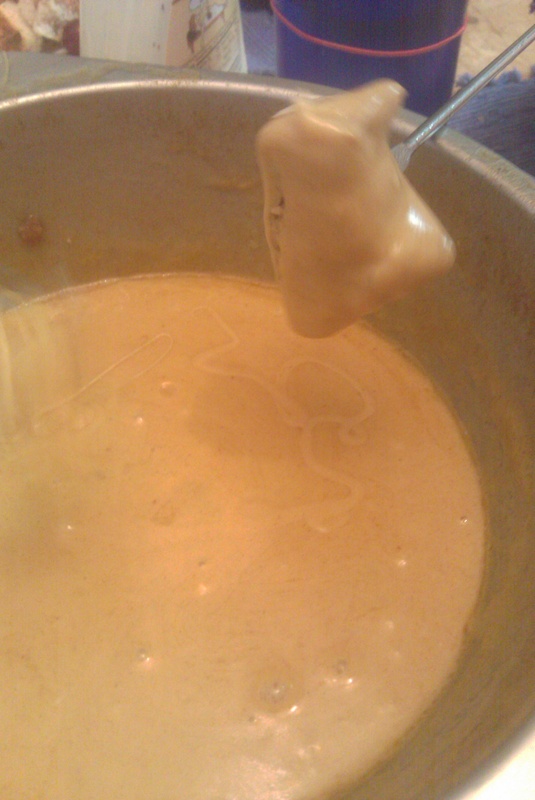 You can even play with your fondue as it begins to melt. Yup, it was pretty amazing! Now, let’s talk about dippers. You can always go with the traditional bread. 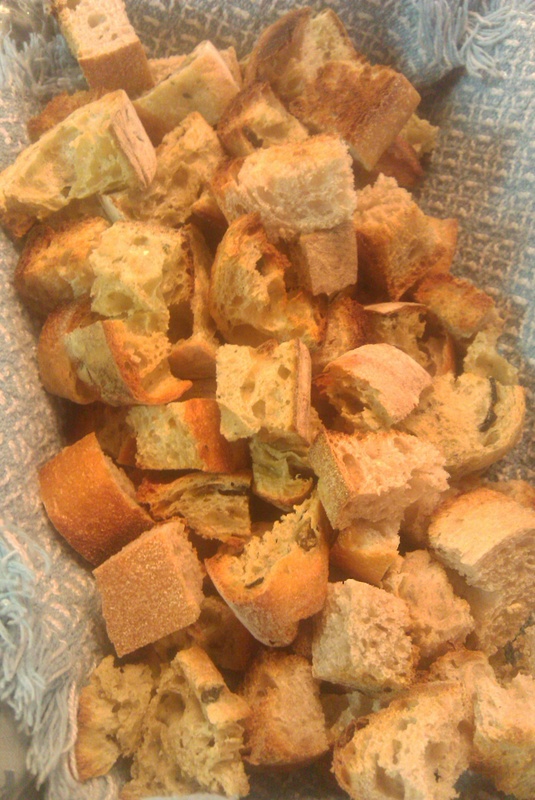 I bought three artisan breads for tonight: Organic Whole Wheat, Italian Round, and a Olive and Herb Filone. The filone was a last minute impulse choice, and boy was it a good one! I highly recommend it. We also put out some veggies: carrots, celery, and cauliflower. 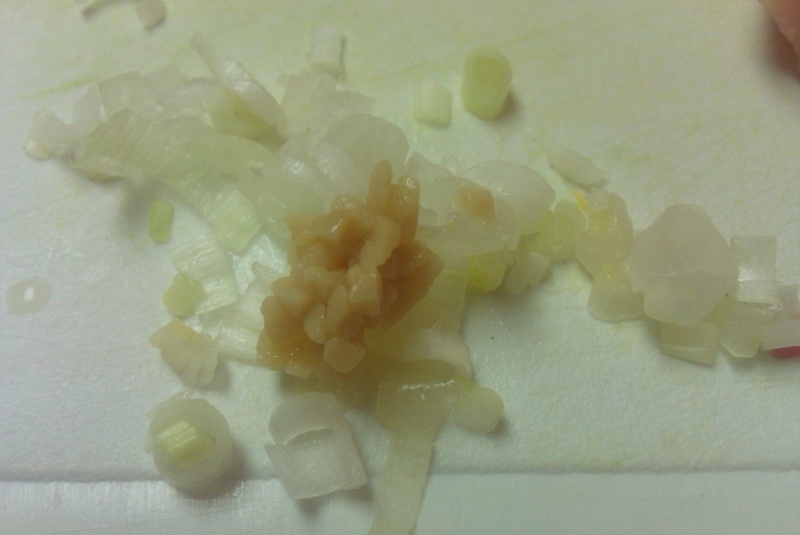 It’s best to just chunk these up and serve them raw as they provide a nice counterpoint to the cheese. Red sweet grapes and Granny Smith apples are two other favourites of mine! I did do some recipe-less cooking tonight for one of the dippers. You see, I’ve got a teenaged brother who can eat us out of house and home. 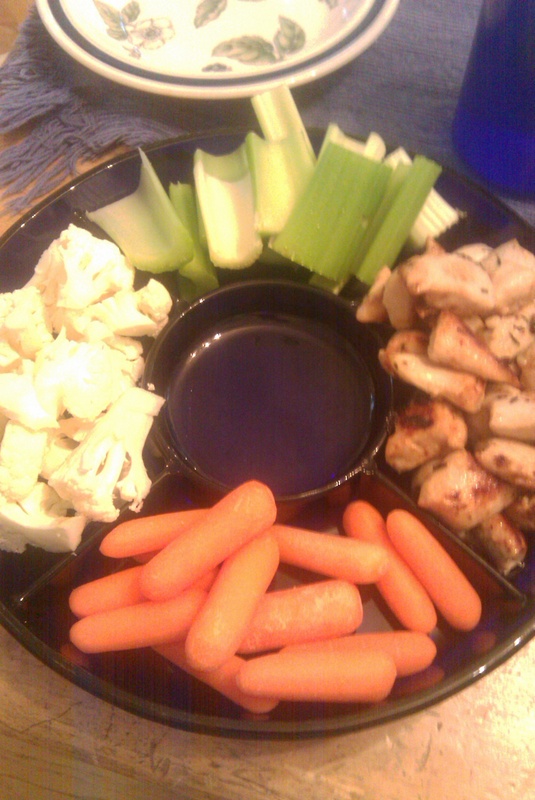 I figured that he probably needed more for dinner than fancy bread and cheese, so I fixed up a chicken dipper. It was really, really good, if I do say so myself! Let them cook for a while in the liquid, adding more wine as needed. 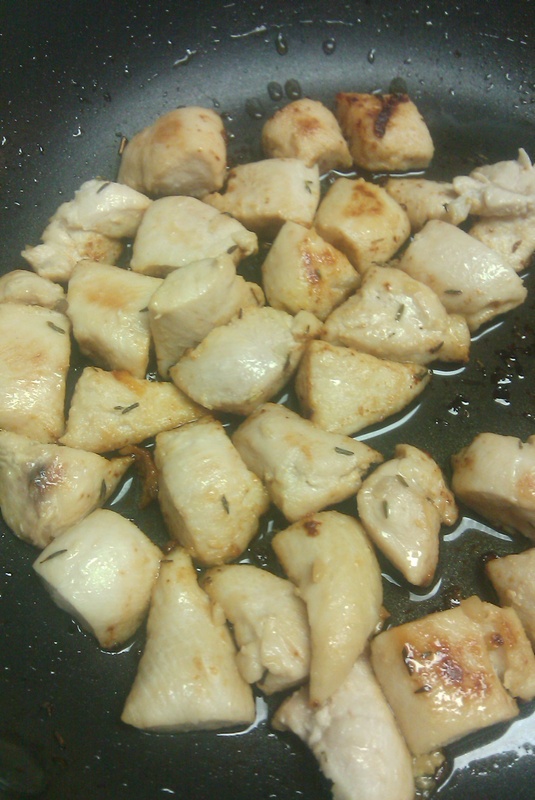 I even added in some thyme for extra flavour! 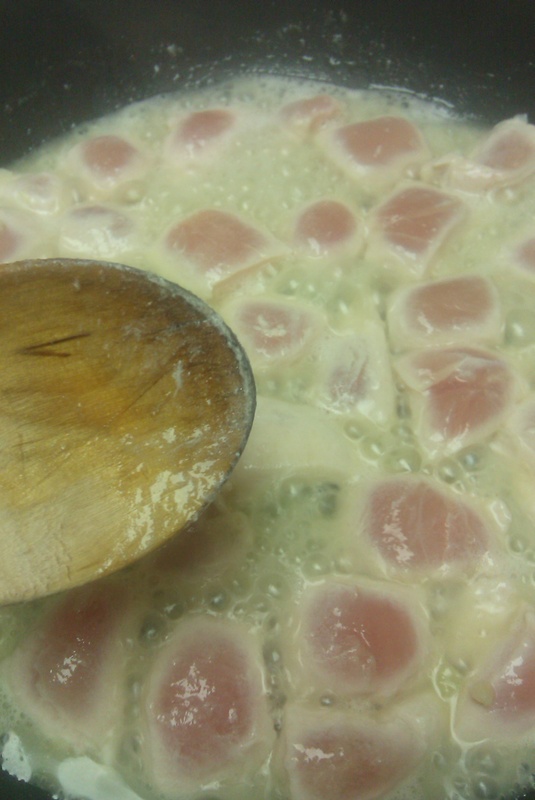 When they are mostly cooked, let the liquid boil down so they will get some colour and a bit of a crust on them. That’s it! Super simple, but very delicious. 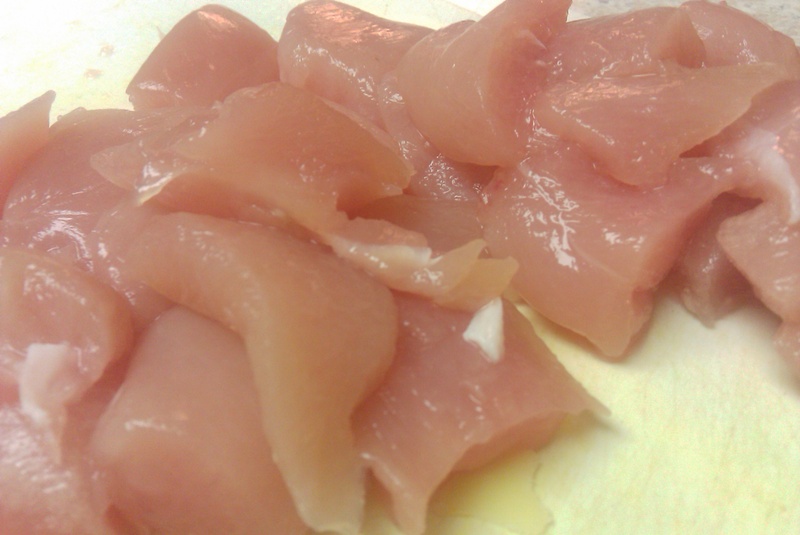 I’m thinking about doing the chicken again soon over pasta with some sort of olive oil sauce. Okay, so there’s another minor component to this meal. With that much cheese and bread, you do want something somewhat healthy. 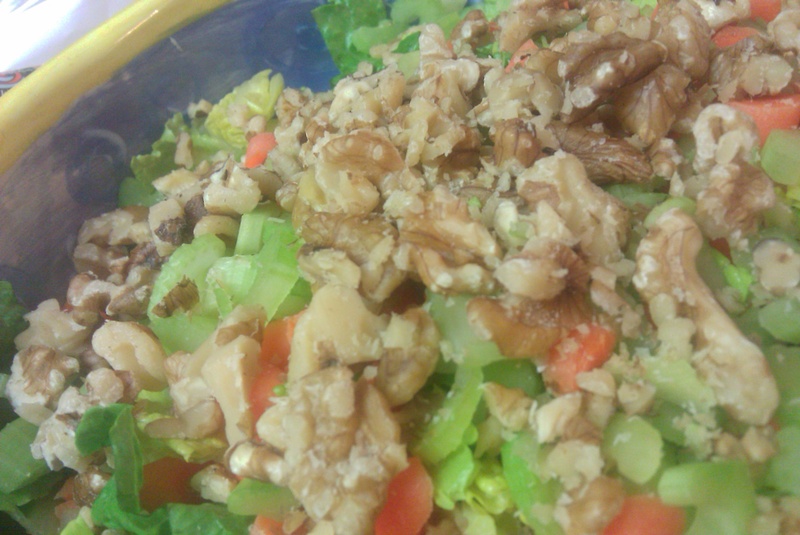 I filled this square with a simple organic salad: lettuce, carrots, celery, and walnuts. Nothing too fancy, but it complimented all the other flavours well. Okay, I did dessert too, but you all will have to come back for that. Thanks for cooking with Miss Woodhouse! If you have a favourite fondue recipe, dipper, cheese, or side, leave it in the comments! I’m always looking for food suggestions. Faithfulness is not something that we can find a lot of in our modern world. It’s increasingly difficult to find a faithful wife, a faithful husband, or a faithful friend. Faithfulness takes on different aspects too. This week, I’ve sat back and observed wives being emotionally unfaithful to their husbands, and husbands being physically unfaithful to their wives. I’ve seen friends help “friends” betray friends, and watched the results of friends not being faithful to keep promises. I’ve heard people share confidences that they swore to keep, and I’ve seen people walk away from faith in God. Yet, no matter how unfaithful humanity is, God remains steadfastly faithful. He does not betray our trust, or abandon us to ourselves. We don’t have to work through things alone, nor does He abandon us to our own foolishness when a “better person” comes along. He’s there for us, whenever we need Him. All we have to do is reach out. It’s interesting: over the past few years, PhotoShop has come to mean so much more than a simple editing program. Just like we say “Google” to describe people using a meta-search engine to find out information, so we apply the phrase “PhotoShop” when we intend on editing a picture. Such a common phrase. Such a simple goal: to edit/fix/improve pictures. WHO KNEW IT WOULD BE SO HARD TO DO????????? Apparently, when I bought PhotoShop Elements 6 last year (Please, no comments on the Elements portion of that title. The fact that Elements is stumping me is a crushing blow to my ego.) I had no idea exactly what I was getting into. I loaded it on my old laptop, and played around with it a bit. Really though, the most I did was to take a prom picture and change the background colour to match the scrapbook paper we wanted to mat it on. Kid’s play. Silly stuff. Then that laptop died. So, I got a new laptop- the one I use now. (It’s a Sony Vaio CS series and I love it! Really, I should do a post on how great it is….) This was right before school started up in the fall, so I only loaded the absolute necessities: Flash for school, Microsoft Word for school, Microsoft PowerPoint for school, iTunes for…school…erm, yeah. Moving on…. See? 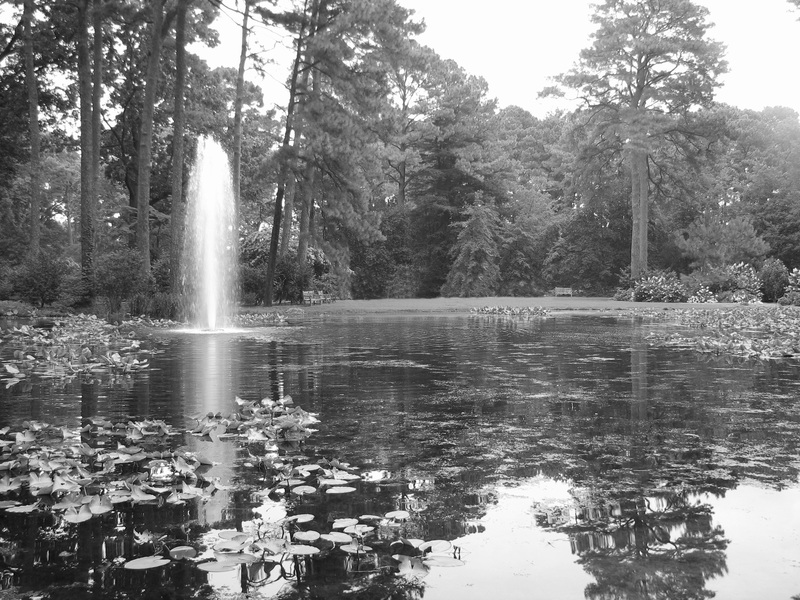 Pretty water, pretty fountain, lovely trees, nice reflections, and great contrast with the black and white. Except, there’s this cart. Trolley, really. You see, there was a wedding across the lake, and that trolley brought the wedding guests and some of the wedding party. I can’t really complain about it, but still…a perfectly beautiful shot ruined. I mentioned in the blog title that this was the beginning of a journey for me. That’s because I’ve been lucky enough to have an awesome customer offer to help me out with PhotoShop (Elements). Thus, I’m now working my way through this PhotoShop class manual. I’m not doing great, but I’m starting to understand some of the basic elements. I think…sort of…*looks for the curve option*…. All that to say, I’m hoping to have some more cool PhotoShop examples for you all in the near future! As usual, click on the pictures to see them full size…. I just realized that I forgot to put the results of last week’s poll into yesterday’s Starbucks post. So sorry! A lot of you voted. You all said that you live for Starbucks. 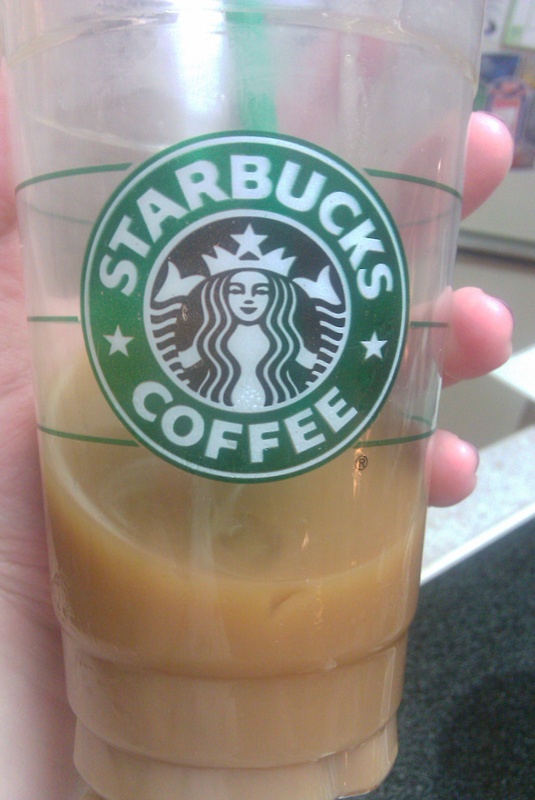 I will continue to blog about Starbucks! More polls to come throughout the next few months; stay tuned. I’ve had a rough week. There’s various reasons for this, some that I’ve shared with you all and some that I’ve not talked about here. Sometimes all you can do in life is keep moving forward. When you don’t know where forward is, then you have to just press on blindly and pray that you are doing the best you can. Right now I feel like I’m in that blind place; I know that the end of this difficult time has to be near, but I can’t see light or hope. So, I press on, hoping that I’m doing what is right, and trying not to take adversity as discouragement. This life takes faith, whether you choose to believe in faith or not. Quite frankly, I can’t live without faith. I’m sure that you, dearest of readers, are probably going through similar issues. This song has resonated in my head this week; I hope that it can bring you the same comfort that it has brought me. Update: Steve Pearson, who takes some of the most lovely photographs ever, referenced a Bible verse in his comment. I thought that I would put it up here so you all can benefit from it as well; I found it very comforting and encouraging. Thanks, Steve! Our store opened on an April 1st. In a way, I think that this explains the most fully just why we are insane. I frequently refer to our store as the biggest April Fool’s Day joke, and no one really argues with me. We, in short, are mad as March hatters…hares…hatters…oh, nevermind. Need proof? Oh, I can help with that! Let’s start on the partner level. Here are some of the crazy things we do! First, I should explain what you are looking at. If your store has a warming oven, then you might have noticed that there’s a trash bin underneath, neatly hidden behind a drawer. The theory is that you put a large trash bag into the metal bin, and only use it for the paper and plastic waste associated with warming up sandwiches and pastries. However, our store is crazy. 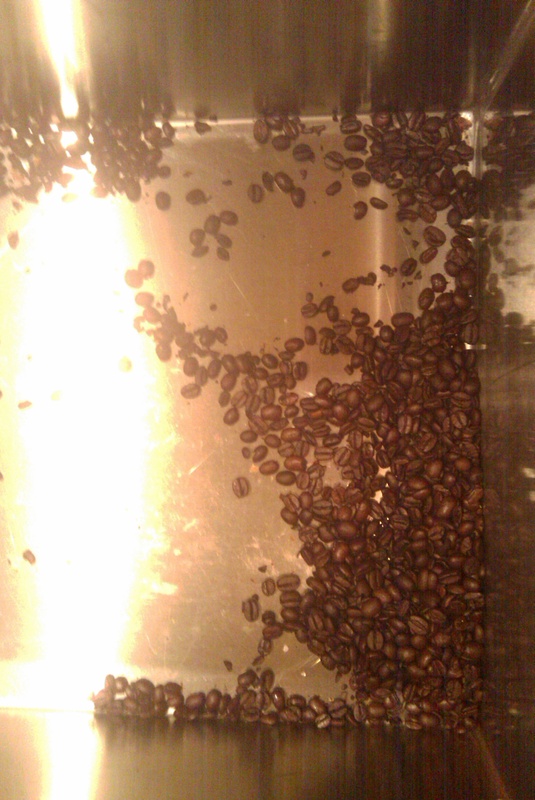 Apparently, this particular day not only did someone decide to forgo the trash bag (issue #1), but they, for some unknown, mysterious purpose, decided to then dump a pound of coffee beans in the drawer. What you may not be able to see is that this drawer is about 16 inches deep and 24 inches wide. This was no picnic to clean up- in fact, three of us just stood there for a good two minutes staring at, well, this. We love celebrations. We also love having a hierarchy of seniority. Since most of our store’s partners have been with the company 4+ years, this is usually based on age. 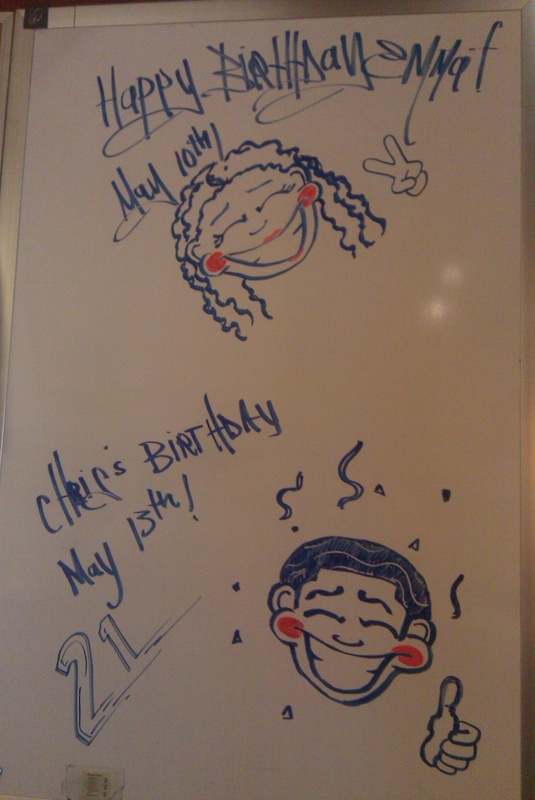 The only problem is that this board is in full view of the customers…and we put our birthday messages up a month before the events took place. 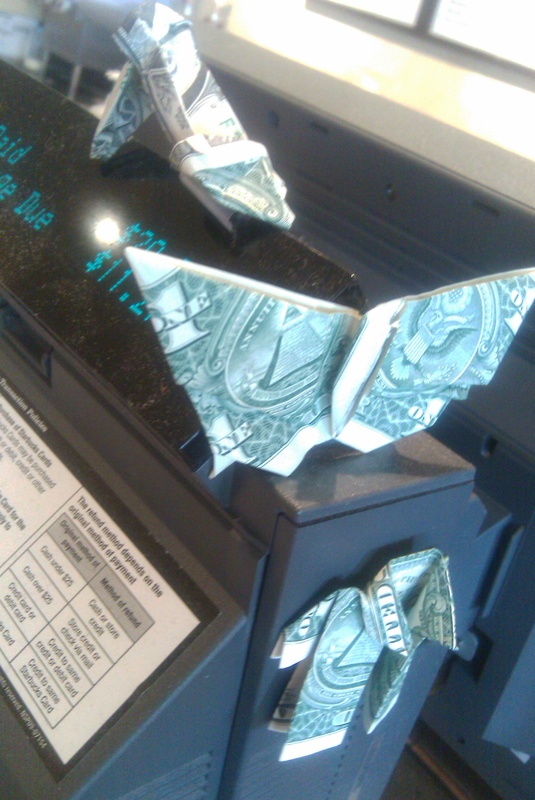 For some weird reason, this really confused the customers. Can’t imagine why…. We know who did a few of them, but several of them just randomly showed up! Okay, now we really start to have some fun! I feel that I must preface these remarks by assuring you, dear readers, that I have full permission to use this on the blog. I asked permission. Three times. In front of witnesses. Among our amazing regular customers, we have these two men that come in every day/night. 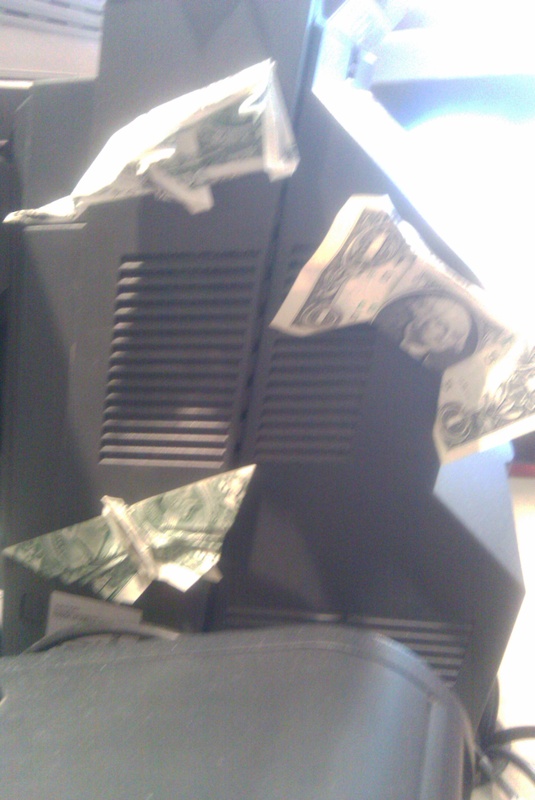 One of them is a motion graphics artist, Steve. Jim works with the Census. He’s also quite talented in Kenjutsu. When I remember, I call him Sensei. After this latest escapade, we have a new nickname for him; but there I go getting ahead of myself again! They’ve become quite good buddies over the past few months, and when the two of them put their heads together…well it scares me just a lot. Suffice it to say that for a certain reason, Sensei is teaching Steve the art of Kenjutsu. At Starbucks. Right beside our store. In full view of all baristas, customers, and the highway that runs beside the store. Did I get video of the first lesson? But of course! Enjoy! I’m really proud of myself that you can barely hear me giggling. However, after seeing the videos Mum decided that we needed to call them Obi-Jim and Luke. I might have fallen on the floor laughing at that; but there’s no proof of that. Okay, let’s not even talk about how “Until” lost its “i”. I’m sure that it’s a painful story with no bearing on this case. However, I do have to wonder exactly how we are supposed to follow these directions. I mean, I understand the intent, but they are asking the impossible. There is no way to take a loaf of lemon pound cake and instantly thaw it. These directions are physically impossible. The defence rests! Well, I think that’s quite enough fun for one post. Until next time, stay cool. No, I mean it! 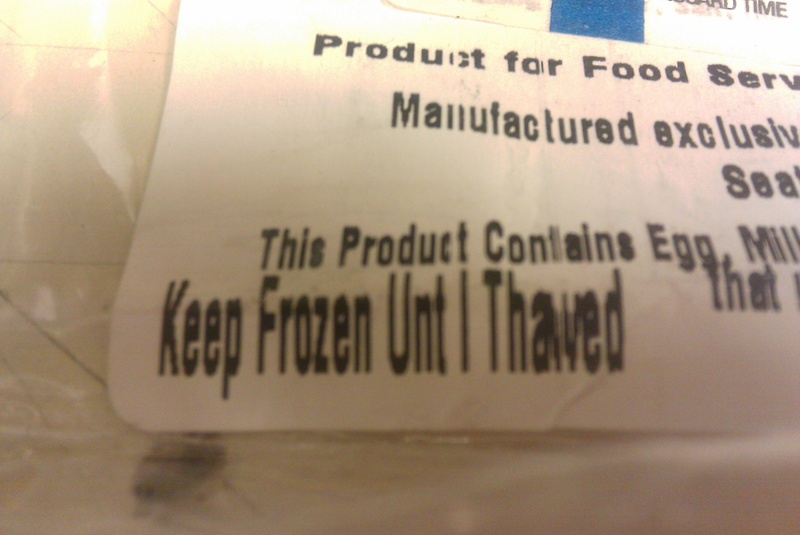 You aren’t allowed to thaw yet!!! More pictures from my mini photoshoot at the lake. 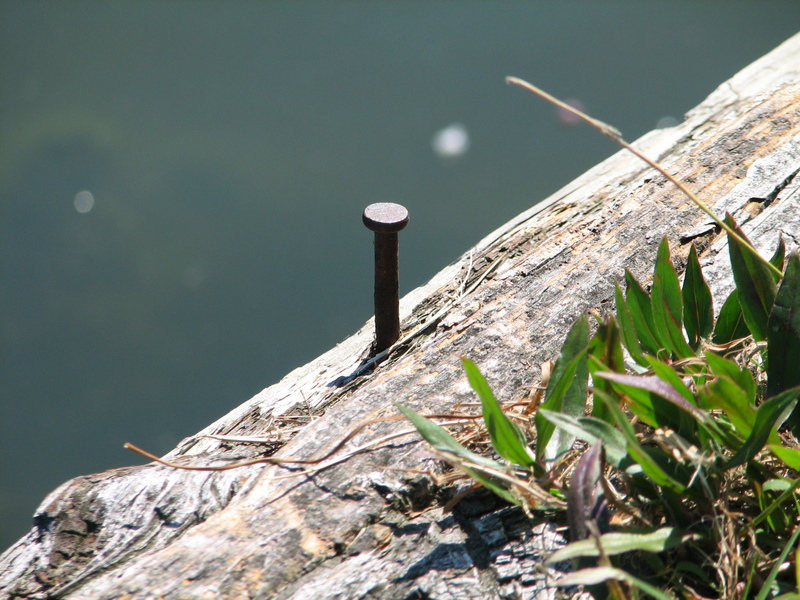 Quite frankly, I’m just grateful that I saw this before I stepped on it; not only do we have horrid water in the lake, but apparently we have tetanus carriers strategically placed around the perimeter. It’s a good thing, then, that it makes for an interesting picture! Otherwise, I’d be a bit upset. Not much of anything more to say about this, excepting that you should click on it to see it full size. See you this weekend for a Starbucks post! There’s a song by Natalie Grant that I’ve loved for a long time, but never quite knew why. Lately though, I’ve come to believe that I was drawn to the song for such a time as this. Trust me, this is not a fun time. Right now, I know a child who is dying. She’s so young, and she’s been so brave for so many years. Understandably, she’s grown tired of fighting, of sickness, of pain. I can’t fathom what she’s lived through. Hearing about her struggles, it really makes me question why certain things happen in this life. Of all the things that seem senseless, children struggling with illness makes the top of my list. It really does feel unfair. Why do people like her have to suffer and die, while others get to live? Basically, why do good people die while bad people live? I don’t know that there is a good, logical answer to this question; at least, not an answer that would give comfort to people. Rather, the only comfort I find in this particular situation is found in faith: faith that God is with her, that He is in control, and that He is sovereign over the affairs of humanity. It’s such a powerful word, with powerful imagery attached to it. What I particularly like about it is the fact that none of the action depends on the person being held. If someone is holding you, they don’t need for you to respond or react in order to do so. No matter what, they hold on to you. My friend is weak, she is frail. I don’t think that she has the physical or emotional strength to hold on to anything, but that’s okay. God is holding her, and He’s not going to let go. So far, the song lyrics are comforting; however, they don’t stop there. The lyrics go on to talk about the best way to react when the things that are difficult go horribly in your life or the lives of people you care about. This is all too true. When bad things happen, the most natural reaction is to become angry and bitter: sometimes at those involved, but most often at God. It’s okay to grieve. In fact, it’s natural. However, wisdom means coming to accept tragedy, acknowledge its effect, and then turn to the future. Because, no matter what tragedy happens, the greater amount of life goes on; hope goes on. So in all of this, I choose to believe in hope, I choose to trust in the providence of God. I choose to believe that God will hold my friend to the end of this trial, whatever or whenever that end might be. 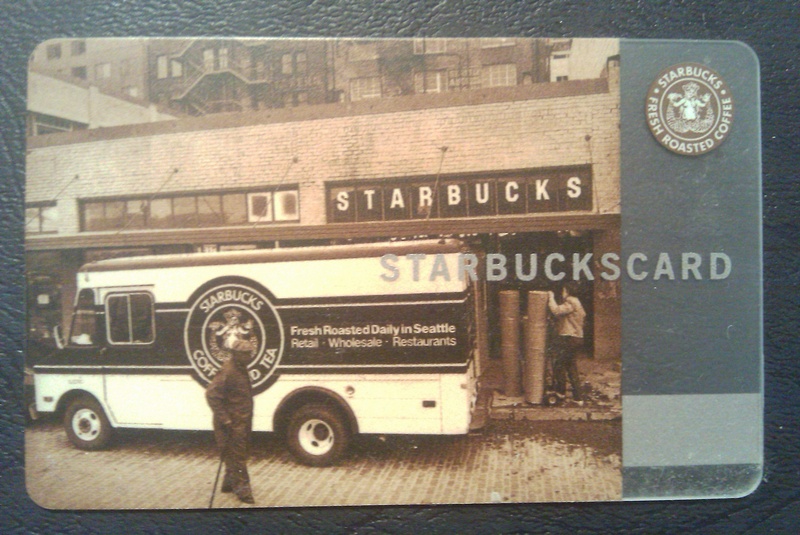 Almost forgot to post this today, but I’ve always wondered what my readers really think about Starbucks. Be honest now…. I’ll post results next week, so vote often and tell your friends!